Amazon.com has launched a buy two, get one free Blu-ray disc promotion. 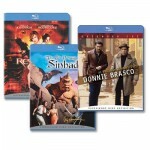 The sale includes great titles like Jerry Maguire (Won 1 Academy Award, nominated for 5), Donnie Brasco (nominated for 1 Academy Award), foreign action/drama La Femme Nikita, and the 1958 classic The Seventh Voyage of Sinbad (50th Anniversary Edition) — all must-haves for your hi-def collection. Below we put together a few Blu-ray “3-packs” that may peak your interest. You can also view the full list of Blu-ray Discs eligible for the promotion. The sale ends March 9. Shop for more Blu-ray titles at Amazon.com .